Are you stuck in one of our games? Here’s how to obtain hints that will get you moving again! Our adventure games feature enough detailed hint support to get you through just about any puzzle you’re stuck on. That support has evolved since the first release of each game, so you should make sure that you have the current version. To check the version of the game you’re playing, press the Caps Lock key at any point during play. The version number will appear just above the hint button. If you do update, your saved games will no longer work — you’ll have to start the adventure over again. You may be asked for your registration information. Once you have the latest game, getting hints is easy. 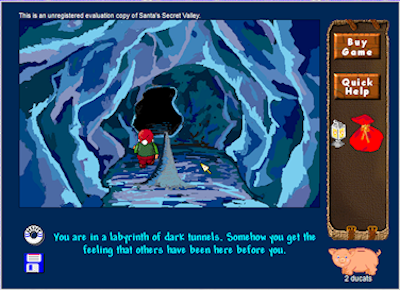 In Santa’s Secret Valley and All Aboard for Santa, complete hint support is built right in: just click the hint button and keep clicking and reading until you find the answer you need. Most of the time, the “I would like a hint regarding my current location” option will tell you what you want to know, but the other options may sometimes be helpful also. Sometimes you may need to check hints in several locations to find the way forward from a particularly sticky situation. In Uncle Julius and the Anywhere Machine, the procedure is a little different. Clicking the Hint button will give you useful hints in most cases, but for the kind of detailed help available with other games, hold down either Shift key while clicking the button. This will bring up the Uncle Julius Hint Utility (if it doesn’t pop to the front on its own, click its shortcut on your taskbar). The hint utility will lead you through a series of screens to zero in on the problem you need help with. Finally, what should you do if you have tried the hints, thought about them, scratched your head, puzzled for days, and still can’t make progress in your game? In that case, we are pleased to be your hint oracles of last resort. Fill out the contact form with a clear and complete description of your game situation, and we’ll write back as soon as possible with customized help. Important: You must be a registered user of the game to get help with any puzzles that are past the registration point in the game. Please include in your message enough information to allow us to find you in our customer database. At the least, we need your registration name, and the email address you supplied when registering.